A new survey of 300 American supermarket decision makers found that they often stock products bearing labels they don't understand. Demand for foods labeled with animal welfare claims is rising fast in supermarkets, and will likely continue to grow, according to a survey of over 300 supermarket decision makers across the country released on Monday. In fact, products boasting that they adhere to higher welfare standards are estimated to soon be on par with organic foods in terms of availability on grocery store shelves. The survey was conducted by the American Society for the Prevention of Cruelty to Animals (ASPCA), a nonprofit dedicated to reducing animal cruelty, and Technomic, a food industry consulting firm. Rising attention to animal welfare in the production process doesn’t just mirror other trends in the food industry, like “clean” and plant-based eating—they’re intrinsically intertwined. And that makes sense. However, this isn’t a feel-good story about a sea change in the way we produce meat. Rather, it’s a tale as old as time, one that we tell over and over again in the realm of food and marketing: What the eater values, the company will try to market around. And what labels claim can be reassuring in theory, but not always in practice. Just as shoppers can be confused and mislead by animal welfare claims, so often are retailers. Take a stroll through any grocery store and you’ll be bombarded with language and imagery that suggests your meat, dairy, and eggs come from animals who’ve roamed leisurely through clean, green pastures. But for nearly every package of meat that bears a label promising the product is local, or grass-fed, or non-GMO, there’s a hormone-free, all-natural nothingburger right beside it. Surprise: None of these claims are regulated. To be clear, there’s a big difference between animal welfare claims and animal welfare certifications. The former includes the unsubstantiated statements noted above. The latter are verified by independent, third-party oversight bodies. 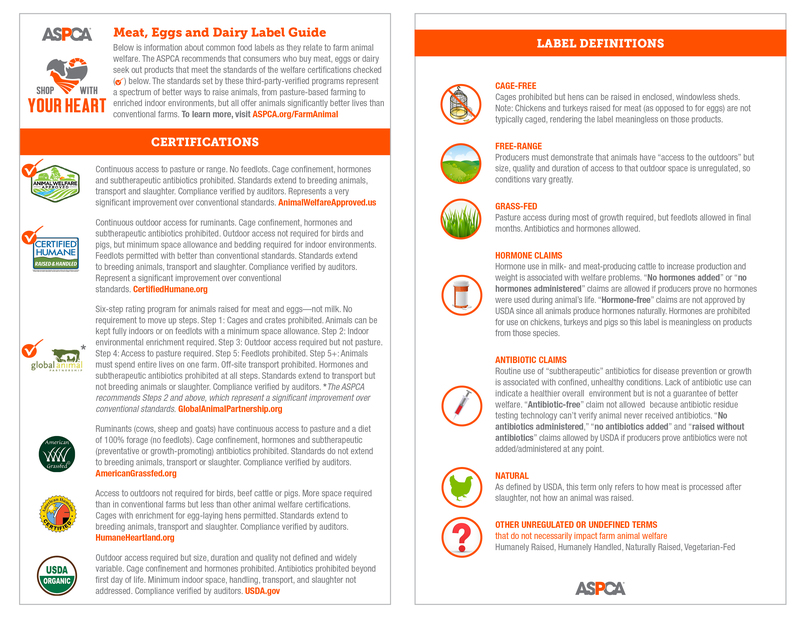 To help wade through these murky waters, ASPCA has published a meat, eggs, and dairy guide that endorses three specific verification programs: Animal Welfare Approved, Certified Humane, and Global Animal Partnership. However, for most eaters, the endless range of claims and labels end up inducing a kind of sensory overload. And just as shoppers can be confused and misled by animal welfare claims, so too are retailers. Less than half of supermarket decision makers surveyed by ASPCA and Technomic felt that they had a very good understanding of most animal welfare claims, including “cage-free,” “antibiotic-free,” “free-range,” and more. In fact, 95 percent of them erroneously perceived “humanely raised” as a strong welfare claim. Of all the grocery stores surveyed, less than 50 percent of them stocked products with animal welfare certifications. On the other hand, 65 percent stocked products with “pasture-raised” claims, 62 percent carried products bearing “free range” claims, and 51 percent offered products that featured “humanely processed” claims. Save for a government agency stepping in to regulate animal welfare claims, who should be responsible for making sure labels say what they mean? Roulston says it’s retailers who are best positioned to sort truths from claims. “There’s a lot of responsibility to go around … but I think retailers do have a really unique position: They’re the gatekeepers for where consumers can get these options. “There’s ways that they can do that, [like] making sure that their procurement departments are actually stocking the shelves with better products and having a good look at their shelves already. Are there misleading products that aren’t doing themselves or their consumers any favors?” says Roulston. A 2016 ASPCA survey found that 67 percent of shoppers said they would pay more to buy products that claimed higher animal welfare standards over products that didn’t. Though, perhaps the greatest truism in food marketing is that eaters rarely purchase in line with what we say we value. So, while retailers can and should vet the products they stock, we also bear some responsibility when it comes to purchasing decisions. Whether or not we accept that challenge is another matter entirely.